Tonight a narcotic selection of songs of haunting beauty. First, gladly fulfilling our Canadian content obligations, here’s the Cowboy Junkies cover of “Sweet Jane,” which even Lou Reed says is the best version of the song ever. This entry was posted in Video on March 13, 2010 by Michael Happy. Thanks for this post, Bob. Frye was quite ready to make his political sympathies–and antipathies– known. I remember him introducing Harold Bloom to a packed house at the University of Toronto just after Reagan had been elected president for the first time. There was something in the title of Bloom’s talk concerning “creation-by-catastrophe,” one of the gnostic concepts he was using at the time of his Anxiety of Influence. Frye, dead-pan as usual, stated that it was particularly appropriate to have an American critic speaking to a Canadian audience on the theory of catastrophe in light of the election results that had just taken place in Bloom’s homeland. The audience, needless to say, broke up. Most of us, I assume, would share the assumptions about liberty and equality . . . that have been formulated at least since John Stuart Mill’s time. We take for granted the principle of equality of all citizens before the law and the principle of the greatest amount of individual autonomy consistent with the well-being of others. To the extent that the laws are bent in the interests of a privileged or aggressive group; to the extent that citizens live under arbitrary regulations enforced by terror; to that extent we are living in an illegal society. If we regard our own society as at least workably legal, we also take largely for granted that the real basis for the effectiveness of law in such a society is an invisible morale. The law in itself is compelled to deal only with overt actions, so that from the law’s point of view an honest man is any man not yet convicted of stealing. But no society could hold together with so loose a conception of morality; there has to a sufficient number of self-respecting citizens who are honest because they like it better that way. This entry was posted in Politics on March 13, 2010 by Joseph Adamson. Frye was not opposed to all anarchism, just the violent and terroristic variety––of the kind he witnessed when he was at Berkeley in 1968. Anarchism of the pastoral variety, as in, say, the Amsterdam provos, or the anarchism of Kropotkin’s mutual aid, he could affirm. “The radicalism of today,” Frye wrote in 1968, “is closer to nineteenth-century anarchism than to the Communism of Stalin’s era. Like the anarchists, contemporary radicals think in terms of direct action, or confrontation; and their organizing metaphor is not so much takeover as transformation or metamorphosis. Nineteenth-century anarchists showed a curious polarizing in temperament between the extremes of gentleness and of ferocity: there were the anarchists of ‘mutual aid,’ and the terrorist anarchists of bombs and assassinations. The essential dynamic of contemporary radicalism is non-violent, and its revolutionary tactics seem to descend from Gandhi rather than Lenin. When contemporary protest movements commit themselves to violence, they show some connection with the fascism of a generation ago, a similarity which confuses many people of my generation, whose ‘left-wing’ and ‘right-wing’ signposts point in different directions. They feel turned around in a world where not only the Soviet Union but trade unions have become right-wing, and where many left-wing movements utter slogans that sound very close to racism” (“The Ethics of Change”). I wonder if the records of the Forum during the 1940s and 1950s have been preserved. 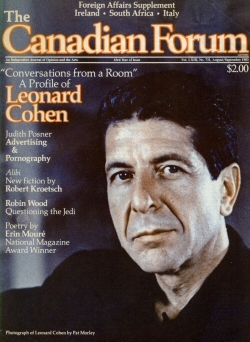 Robert Fulford’s 2001 article on the death of the Forum here. This entry was posted in Bob Denham, Politics on March 13, 2010 by Bob Denham. Further to Bob’s post citing Frye on the interchangeability of the Liberals and the Conservatives before the advent of the C.C.F. 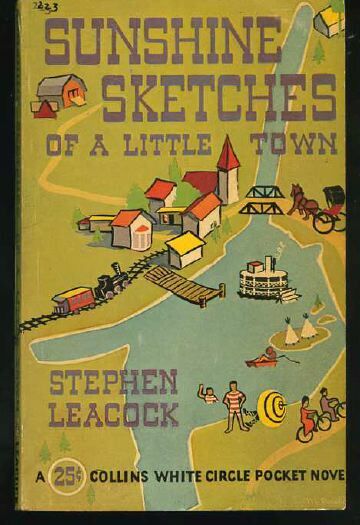 From Stephen Leacock‘s “The Great Election in Missinaba County” in Sunshine Sketches of a Little Town. Let me begin at the beginning. Everybody in Mariposa is either a Liberal or a Conservative or else is both. Some of the people are or have been Liberals or Conservatives all their lives and are called dyed-in-the-wool Grits or old-time Tories and things of that sort. These people get from long training such a swift penetrating insight into national issues that they can decide the most complicated question in four seconds: in fact, just as soon as they grab the city papers out of the morning mail, they know the whole solution of any problem you can put to them. There are other people whose aim it is to be broad-minded and judicious and who vote Liberal or Conservative according to their judgment of the questions of the day. If their judgment of these questions tells them that there is something in it for them in voting Liberal, then they do so. But if not, they refuse to be the slaves of a party or the henchmen of any political leader. So that anybody looking for henches has got to keep away from them. This entry was posted in Politics on March 13, 2010 by Michael Happy.